The question is from CAT Geometry - Triangles. It discusses about an equilateral triangle with a square inscribed inside it. We have to find out the ratio of the area of the square to that of the equilateral triangle. CAT Geometry questions are heavily tested in CAT exam. Make sure you master Geometry problems. Question 25 : There is an equilateral triangle with a square inscribed inside it. One of the sides of the square lies on a side of the equilateral △. 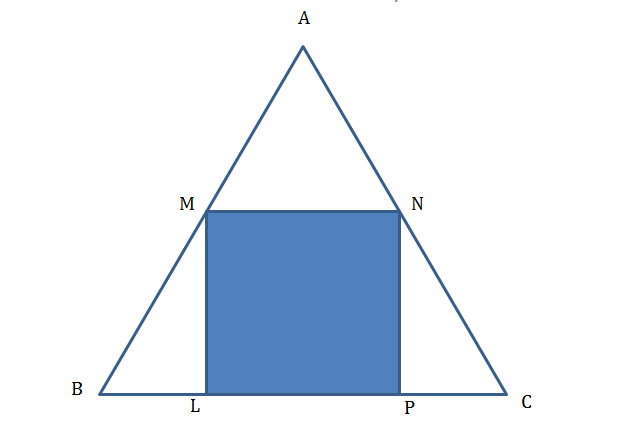 What is the ratio of the area of the square to that of the equilateral triangle? Method of solving this CAT Question from Triangles: Find the ratio of the side of the square and the side of the triangle and you are through. The question is "What is the ratio of the area of the square to that of the equilateral triangle?"